Is your class learning about local government? If so, why not register for a tour of City Hall? During a tour at City Hall, students will gain a better understanding of how their local government works and offers the opportunity to experience first hand what happens at City Hall. Students will be led through an interactive tour of this unique, award winning building to see where some of Edmonton's important decisions are made. A highlight of the tour is a visit to Council Chambers where students may even have the opportunity to observe council at work! 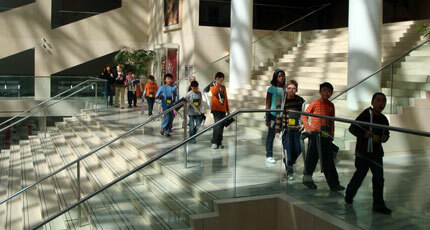 City Hall tours are offered to all grades. Tours can be tailored for special needs and interests. Please note: City Hall Tour Guides do not speak French, so the 60-minute tour of City Hall will be in English. However, if you would like to lead your class through their Mock Council in French, translated forms are available. To ensure the best experience for your students, please check the Prepare For Your Visit page. Tour Guides are scheduled as needed, so it is important that you arrive at your confirmed date and time. Please note that their are situations where the Office of the City Clerk may have to schedule a meeting in the River Valley Room (where mock councils are held) on short notice and at a time that has already been confirmed for a school. We do our best to find a solution in situations such as these, but in some cases mock councils may have to be cancelled if a solution cannot be found. If you need to cancel your tour, please contact 780-442-1385 or email us at CityHallTour@edmonton.ca as soon as possible.